Show people you know how to dress with style by wearing 2 tone dress shirts that have white collars and cuffs by Daniel Ellissa. Designed in Italy, these great looking two tone french cuff shirts are made for men who appreciate dressing with style. 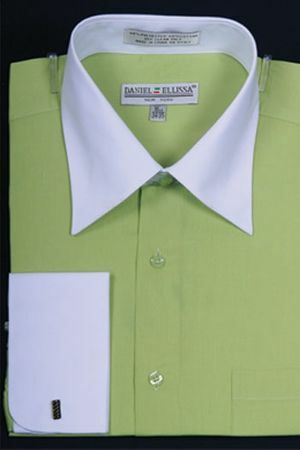 This lime and white collar 2 tone shirt features and classic pointed collar and french cuffs made of easy care cotton/poly fabric.